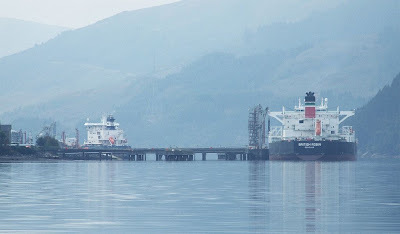 Two tankers, both of which have been seen on ClydeSights before, were berthed at Finnart today, following the arrival of BRITISH ROBIN. The crude carrier had been lying at anchor in Irvine Bay for the past two days. When she steamed up the Clyde this morning, she did an about-turn at the Tail o' the Bank and headed back down-firth to await an improvement in visibility on Loch Long, returning up the firth around an hour later. The other ship is BRO DEVELOPER, which was loading product. She sailed for Belfast this evening.